This collection is dedicated to the memory of the late Steve Wilkinson of Histon who fought tirelessly in conjunction with the Railway Development Society (Rail Future) to re open the Cambridge- St Ives line. Chesterton Junction to St Ives- opened 17th August 1847. St Ives to March South Junction- opened 1st February 1848. The fifteen and a half mile line from St Ives to March South Junction closed on 6th March 1967 when freight traffic declined. The passenger service was also recommended for closure in the Beeching Report of 1963. Little trace of this section of the line exists today. Long sections have been converted to road and the various cuttings to landfill. Many thanks to Stewart Ingram for permission to include some of his pictures from the last day of working. 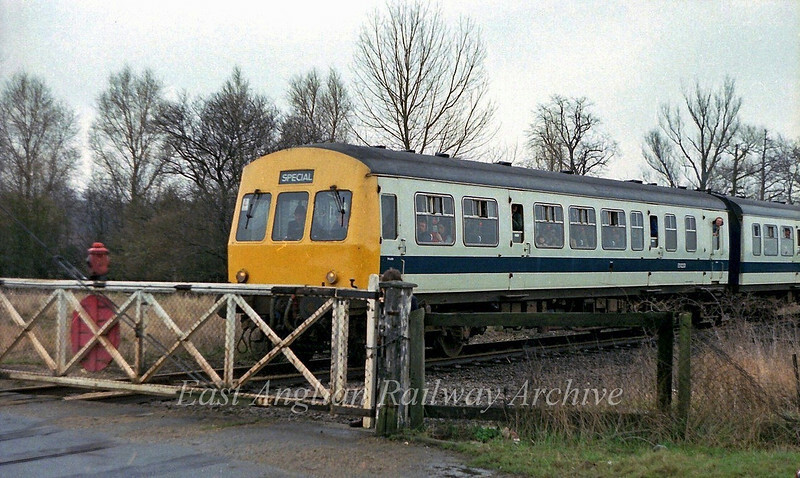 The passenger service from St Ives to Cambridge closed on 5th October 1970, but fortunately the line stayed open for freight traffic to Chivers at Histon until 1983 and a long term sand contract from ARC at Fen Drayton ensured the line stayed open until May 1992. This section of the line has been totally destroyed by the Cambridgeshire Guided Busway which opened on 7th August 2011. Here are a few photos to show how it looked in it's final operational days plus a few relics. The line was once a very busy freight route to March, Whitemoor Yard and the Yorkshire coalfields with over 70 workings a day, the line being open all night. Cambridge- St Ives- March/ Death of a railway 1964. Girton Road crossing 31st March 1979. A Railway Development Society special running from Cambridge to Swavesey waits at the gates. The crossing keepers hut was to the right foreground with a five lever ground frame.